After outclassing the game Mexican-American Lightweight champion Mikey Garcia in a one-sided 12-rounder Saturday, March 16, at Dallas's AT&T Stadium, IBF welterweight world champion Errol Spence Jr. made it clear during the post-fight live interview on FOX that he wants Filipino boxing icon Manny Pacquiao as his next opponent. 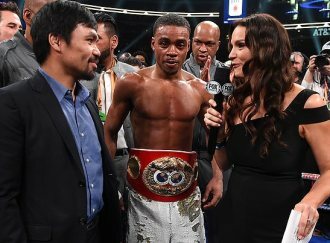 "He (Manny Pacquiao) is a legend in the sport and it would be my honor to fight him next," said a visibly delighted Errol Spence with a broad smile on his face. Then, "is that the fight you'd like, Manny?" asked FOX. "Yeah, why not," replied the ever-popular ever-smiling 'Pacman.' "We'd give fans a good fight." "Would that fight be at Dallas' 40,000-seat AT&T stadium?" "I am so happy to be here in Dallas, and hoping to be back soon," replied Pacquiao, one of the undisputed kings of the sport who back in 2010 headlined in two blockbuster fights at this very stadium, then named Cowboys Stadium. Manny Pacquiao vs Errol Spence would be a unification IBF/WBA world title clash meant to be one of the hottest rumbles of 2019. Would that battle between top welterweight materialize at Dallas AT&T Stadium, being Errol Spence a star in Dallas and the Pacman a hot ticket everywhere? Boxing fans say yes, why not! The author Carlos Costa is a Panama boxing reporter living in the Philippines. Carlos can be reached by email carlos512@hotmail.com and whatsapp/viber +639184538152.